Alexandria - The great Egyptian city built by Alexander the Great during his conquest of Persia. 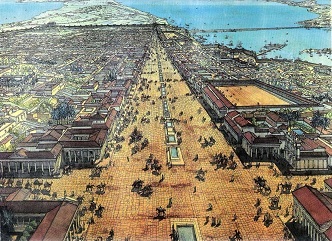 Alexandria grew into a major metropolis that became a center for knowledge and culture throughout the entire Mediterranean. It was home to two major landmarks in ancient times; the Pharos of Alexandria and the Library of Alexandria. The Pharos was a great lighthouse and one of the Seven Ancient Wonders of the World. The library was the greatest repository of knowledge in the ancient world. Unfortunately, the library was burned by Julius Caesar's troops, but the Pharos survived into the Middle Ages.